Turbulence strong enough to catapult unbuckled passengers and crew around the aircraft cabin could become twice or even three times as common because of climate change, according to a new study from the University of Reading. The study is the first ever to examine the future of severe turbulence, which causes planes to undergo random up-and-down motions that are stronger than gravity. Passengers are forced violently against their seat belts, any unsecured objects are tossed about, and food service and walking are impossible. The study examines several different turbulence strength levels, to investigate how they will each change in future. The results show that the average amount of light turbulence in the atmosphere will increase by 59%, with light-to-moderate turbulence increasing by 75%, moderate by 94%, moderate-to-severe by 127%, and severe by 149%. The reason for the increases is that climate change is generating stronger wind shears within the jet stream. The wind shears can become unstable and are a major cause of turbulence. 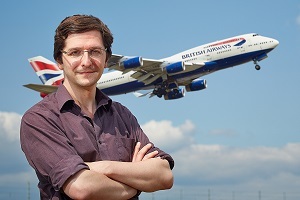 Dr Paul Williams, who conducted the research, said: “Our new study paints the most detailed picture yet of how aircraft turbulence will respond to climate change. “For most passengers, light turbulence is nothing more than an annoying inconvenience that reduces their comfort levels, but for nervous fliers even light turbulence can be distressing. The new study uses supercomputer simulations of the atmosphere to calculate how wintertime transatlantic clear-air turbulence will change at an altitude of around 12 km (39,000 feet) when there is twice as much carbon dioxide in the atmosphere – which is widely expected to occur later this century. The study is published in the journal Advances in Atmospheric Sciences. Turbulence statistics: The North Atlantic flight corridor between Europe and North America is one of the world’s busiest, with around 600 crossings per day. Conservative estimates indicate that there are 790 turbulence encounters annually for scheduled United States carriers, resulting in 687 minor injuries to flight attendants, 38 serious injuries to flight attendants, 120 minor injuries to passengers, and 17 serious injuries to passengers. However, the actual injury rates are probably much higher because of under-reporting, with other estimates indicating that there are over 63,000 encounters with moderate-or-greater turbulence and 5,000 encounters with severe-or-greater turbulence annually. Turbulence is estimated to cost as much as US$200 million annually for United States carriers alone. Funding: This work was funded by the Royal Society. Advances in Atmospheric Sciences: AAS is an international journal on the dynamics, physics, and chemistry of the atmosphere and oceans. It is co-sponsored by the Institute of Atmospheric Physics, Chinese Academy of Sciences. Full reference: Williams PD (2017) Increased light, moderate, and severe clear-air turbulence in response to climate change, Adv. Atmos. Sci., Volume 34, Issue 5, Pages 576&apos;586, doi: 10.1007/s00376-017-6268-2. The paper will be freely accessible to the public from 6 April.